Is Pledging One’s Weekly Contribution Wrong? There are several things that must be said regarding this matter. Is It Wrong to Pledge? There is nothing intrinsically evil about making a pledge. A pledge is simply a statement of intent — a promise or commitment. A pledge may be absolute or it may be provisional. For example, when one becomes a Christian and makes “the good confession” (1 Tim. 6:12), he in effect makes a pledge (i.e. commitment) to be faithful to the Lord. This pledge of allegiance is absolute. One does not take it with any sort of mental reservation, even though he knows that through weakness he will fail many times. But the Christian must resolve to remain loyal to his commitment at any cost (Rev. 2:10). On the other hand, one may make a pledge in a conditional or provisional sense. Jehovah pledged to Israel the land of Canaan (Gen. 15:7), but the pledge was conditioned on their fidelity to the law of God (see Josh. 23:14-16). An employer may pledge to his employees that they will receive an increase in wages at the beginning of the year, provided the economy holds strong. Reasonable employees understand the provisional nature of the promise. The precedent of a giving pledge is set forth in 2 Corinthians 8, where Paul reminds the Corinthian saints that they had pledged a contribution for the poor in Judaea a year earlier (2 Cor. 8:10). They had not, however, been diligent in keeping their intent. Accordingly, Paul admonishes them to get busy and fulfill their obligation. 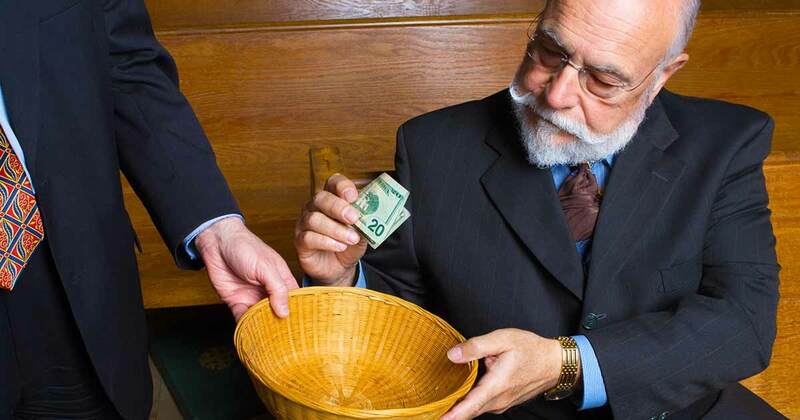 In the local congregation, pledging is simply a way for the leadership to obtain an estimate of what the church’s giving will be for the coming year so that they may judiciously plan the work of the congregation. I know of no eldership that has bound this on the members, forcing every Christian to pledge. When elders make a request of this nature, however, in an attempt to do their work more effectively, faithful Christians should cooperate (Heb. 13:17). Moreover, the elders understand that a member’s pledge is provisional. It may be conditioned upon job factors, health conditions or any number of circumstances that may affect one’s ability to give as they had anticipated. If Matthew 6:3 condemns pledging simply because the elders would know of a brother’s intended contribution, then Matthew 6:6 in the same context would condemn public prayers on the basis of the same principle. What the Lord censures in this context are acts of worship performed for the purpose of attracting the attention of others. Religious ostentation is condemned. There is nothing wrong with the practice of pledging as such is implemented in many congregations of the Lord’s people today. The Corinthian Church – Confidence or Coercion? Does 1 Corinthians 16:1-2 Constitute a Binding Pattern? What About “Local” Church Membership?